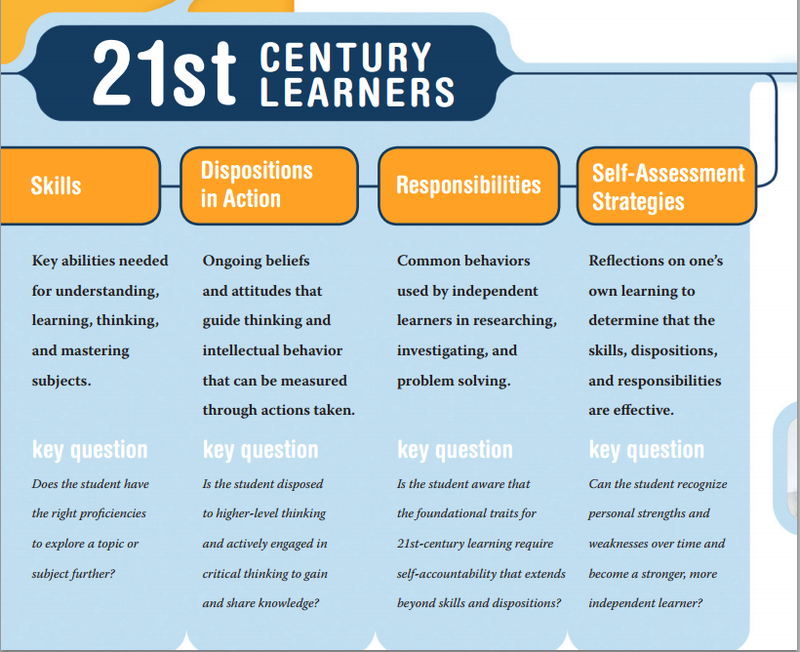 A LinkedIn discussion on Learning tools took me on a journey to find this. Learning about Learning is one of my hobbies. Once in a while I wander off from my regular work to read books, articles and blog posts about this topic. You can download the full (8 page) brochure here (from American Libraries association). If you are interested in some of the other learning related tools and communities you may also like some of these links. Open Library is participating in our eBook lending program. Browse the growing lending library of over 200,000 eBooks! Tools for students to communicate, question, investigate, evaluate, collaborate, test, and create. 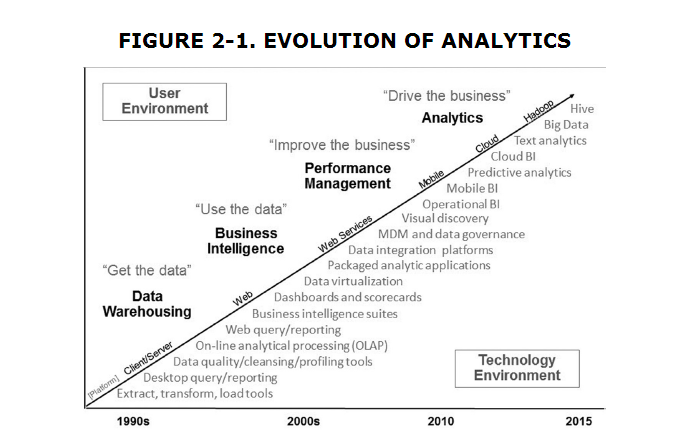 Analytics have evolved a lot over the last 25 years. A chief responsibility for any CEO in today’s business world is to build and to continually evolve the most effective strategy for mining and then leveraging the data that can make a difference within an organization. Through analytics, companies have the ability to use information to make smarter decisions, to develop better products, to improve overall customer satisfaction and to increase profitability. Analytics can become a sustainable resource that provides a competitive advantage because it helps improve business IQ. people who live at the confluence of disparate approaches and opinions have a broader perspective. They see connections and possibilities that others miss. They speak multiple languages and gracefully move between different groups and norms. They continuously translate, synthesize, and unify. As a result, they imagine new ways to solve old problems, and they reinvent old ways to tackle new challenges. They are powerful change agents and value creators. They are not “blue” in the business or “red” in technology, but a blend of the two, hence purple. Purple people are true analytical leaders, and they are the central focus of this book. The book is about Analytical Leaders and how they leverage information. Terms like Big Data, Data Science, Data Engineering appear everywhere. Some people think it is the next frontier and others think it is all hype. My company builds tools for discovering, tracking, gathering information. We were thinking of providing the next layer of tools (InfoAnalyzers) to make sense of all that information. Before jumping in, I wanted to get some sense of the underlying need for analyzing data. Like you, I have some intuitive understanding but wanted to get a better sense of what the leaders in this space think. It is a constant quest and an exciting journey. I accidentally came upon a page titled “A for Analytics” when I was searching for another book. The evolution graph was so fascinating that I paused my search and started reading. Fortunately, I have O’Reilly Safari subscription so jumping into this book took only a couple of clicks. These snippets from the early portions of the book are just a sample. Hopefully I will have a lot to talk about after reading the book. If you want to get an over view this presentation by Wayne Eckerson: Secrets of Analytical Leaders is a good starting point. Mentoring new hires. Mentoring (and really managing) is an extremely high-leverage activity. Over the course of a year, an employee will spend somewhere between 1880 to 2820 hours working (assuming 47 work-weeks and somewhere between 40-60 hours per week working). Spending 1 hour every day for a month (20 hours) mentoring or training a new hire may seem like a lot of time, but it represents only about 1% of the total time the new hire will spend working his/her first year and yet can have a significant influence over the productivity and effectiveness on the other 99% of those hours..
People think in stories. Ever since first humans sat around the first campfire, they’ve been enthralled by stories because stories give meaning to events and facts that otherwise would seem random. Therefore, weave facts into a narrative in order to attract and hold more customers, employees and investors. “stories give meaning to events and facts”. So why don’t we focus on telling stories and helping students develop those skills as well as part of early education? If run any kind of business, this book Competitive Intelligence Advantage: How to Minimize Risk, Avoid Surprises, and Grow Your Business in a Changing World is worth a read. 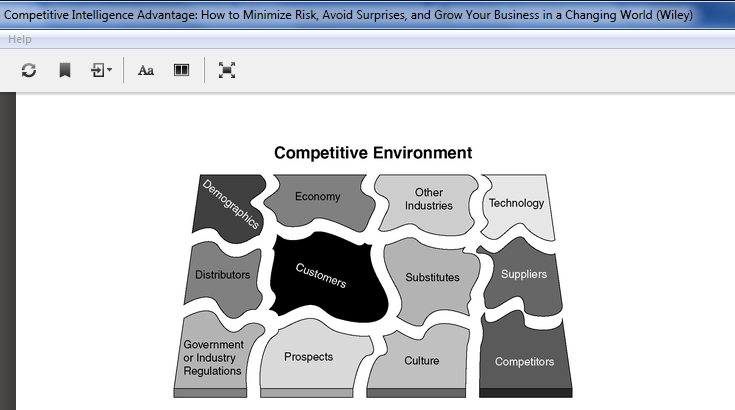 Here is a picture from the book that talks about Competitive Environment (with due acknowledgement) an amazingly clear picture that demystifies Competitive Intelligence. I will provide a brief summary once I finish the book. Sheena demystifies a lot of confusing terms like Business Intelligence, Competitive Intelligence, Competitor Intelligence, Open Source Intelligence and a whole lot of others. This book provides a compelling argument about why every company should pay attention to competitive intelligence. Sheena provokes a lot of reflection about information, intelligence and a context in which you can think about them. .
How we create the new from Dancing About Architecture. We create the new not generally through some mad moment of inspiration in fictionalised accounts of ancient Greeks in baths (though the conditions for this can be forced into existence), but by putting things together that do not normally go together; from taking disciplines (or curriculum areas) and seeing what happens when they are forced into unanticipated collision. Webb Young’s A Technique for Producing Ideas suggests that to create a new idea of value you merely take two disciplines that do not appear to belong together and force them through a blender, because ‘an idea is nothing more nor less than a new combination of old elements’,10 and that a person with a propensity to produce ideas will be someone who sees the relationship between things; relationships that are not necessarily obvious on first sight. The mind, at its best, is a pattern-making machine, engaged in a perpetual attempt to impose order on to chaos; making links between disparate entities or ideas in order to better understand either or both. It is the ability to spot the potential in the product of connecting things that don’t ordinarily go together that marks out the person (or teacher) who is truly creative. the internet is “a giant machine designed to give people what they want.” It’s not a utopia. It’s not magical. It’s simply an engine of convenience. Those who can tune that engine well — who solve basic human problems with greater speed and simplicity than those who came before — will profit immensely. Those who lose sight of basic human needs — who want to give people the next great idea — will have problems. Some times my blog posts are not my posts or reblogs. They simply link to a blog post I like providing some context through a few snippets. I do this because I know some of you would enjoy the original post. Some times I add my own commentary. This adaptive ignorance, she argues, is there for a reason — we celebrate it as “concentration” and welcome its way of easing our cognitive overload by allowing us to conserve our precious mental resources only for the stimuli of immediate and vital importance, and to dismiss or entirely miss all else. Are we missing life by too much of this “Adaptive Ignorance”? What does it mean to live a little – more aware of people, places, events and feelings all around us? Maria’s reviews are so compelling sometimes, I keep buying these books. I am already enjoying it. Once in a while, we let ourselves drift – aided by an old song or a fond memory. There is some comfort in this drift, if you allow yourself the luxury. Maria’s writing does that to me a lot. Software that read tens of thousands of research papers and then predicted new discoveries about the workings of a protein that’s key to cancer could herald a faster approach to developing new drugs. The software, developed in a collaboration between IBM and Baylor College of Medicine, was set loose on more than 60,000 research papers that focused on p53, a protein involved in cell growth, which is implicated in most cancers. By parsing sentences in the documents, the software could build an understanding of what is known about enzymes called kinases that act on p53 and regulate its behavior; these enzymes are common targets for cancer treatments. It then generated a list of other proteins mentioned in the literature that were probably undiscovered kinases, based on what it knew about those already identified. Most of its predictions tested so far have turned out to be correct. And think about the impact. software like this could change the way scientists conduct and assess new research findings. Scientists currently rely in part on the reputation of the people, institutions, and journals involved, and the number of times a paper is cited by others. This is higher order computing. It goes beyond cognitive computing which is simulating certain types of brain like operations.